C Image Credit Image from William Iven	used under a Creative Commons license. 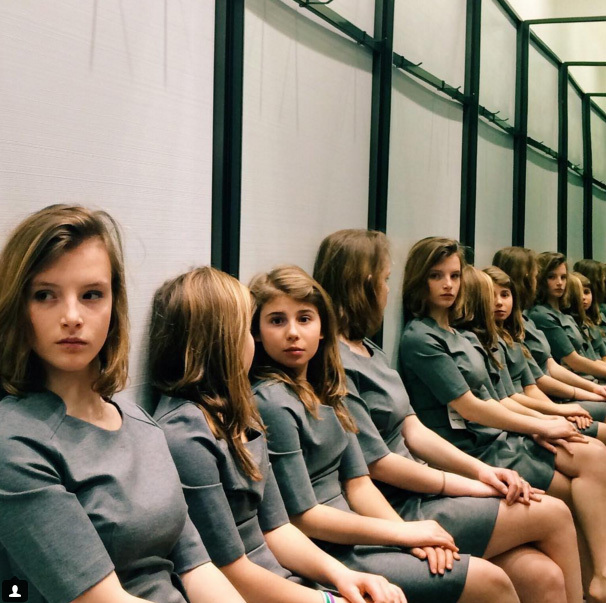 Ok, how many girls are in this photo? It was taken as part of the #WHPidentity project and it’s driving us CRAZY. Can anyone help us out?! 3. We love the indie mag Dumbo Feather, which profiles ordinary people doing inspiring things. We especially loved this sweet interview with George from Motueka in New Zealand – hi George! – an 89 year-old who works a full day every day on his farm, is a paragon of self-sufficiency (he hasn’t been in a supermarket for years), and is just a generally all-round inspiring guy, by the sounds of it. Treat yourself to a five-minute read, and dream about uprooting your life to the Land of the Long White Cloud. 4. Ok, we just discovered clickhole. Maybe we’re late to the party, maybe we’ve just been too busy reading Buzzfeed, but this little gem of a site is sure to put a smile on your dial when you’re sick of click-baity nonsense in your feed. 5. We also discovered the podcast Song Exploder this month. This is definitely the place for those of you who like spending hours dissecting the subtle lyricism of mid-00’s Evanescence or Kanye or somesuch. Basically, whatever your bag in music, these guys cover it: a brief peek through the podcast back-catalogue features episodes that tell the entire story of a particular song, by artists such as MGMT, KT Tunstall, and Patti Smith – so yeah, it’s diverse. And addictive. You’ve been warned. 6. Speaking of songs, now that it’s officially spring, we felt like listening to some light, bright, sunny, dance tunes (so many adjectives!). The appropriately named Sonnenkind by Charlie Boulala (we like this MÖWE remix) is not a new song, but it might be new to you – and it’s perfect for spring. This will make you feel like dancing on the train platform. 7. Spring also brings with it the desire for completely changing our lives. Again. ‘Spring clean’ anyone? If you’re wanting a bit of inspiration for that kind of beautiful, nutritionally-balanced, holistic kind of schtick that we all seem to love lapping up rather than actually doing – well, bonberi is the website for you. See you in Whole Foods! 8. Yet another podcast, because yes it’s back to the commute this week, sorry guys. Fans of Freakonomics will be glad that they don’t have to wait for a third book to get their fix: the Freakonomics podcast is a thing, and we feel infinitely more informed about the world as a result. You’ll thank us at your next dinner party, when you stun the room with your insights into behaviour therapy, migration and why no single person on earth knows how to make a pencil. 9. The BBC’s first online-only drama is the pretty awesome Thirteen – have you caught it yet? If you need a break from The Night Manager, and you’ve finished Making a Murderer, this show about a woman who’s trying to integrate back into real life after being abducted is completely gripping. Because yes, the weather’s getting better but it’s still a long way from perfect and your duvet is calling. 10. And finally, did you catch Emily Watson beat-boxing for gender equality? Enough said.